Photo by Martin Briscoe. 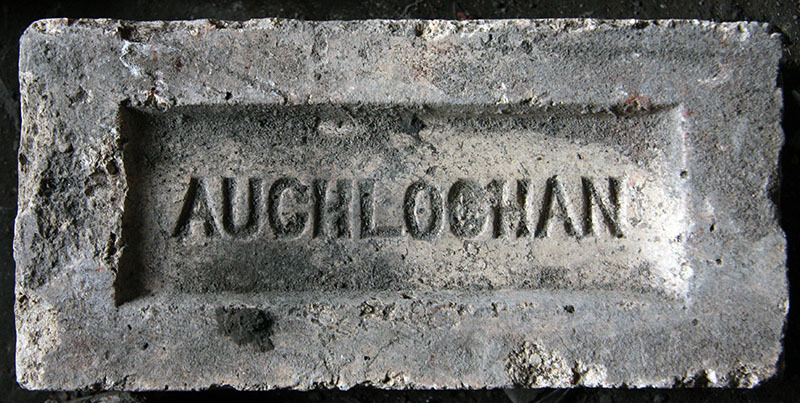 A product of Tannochside Brickworks, Uddingston, Lanarkshire, in operation from 1919 to 1939. Peggy found this one on Gillies Hill, Cambusbarron near Stirling. 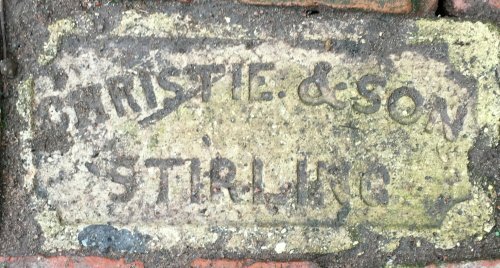 Found in West Kilbride, Ayrshire by Martin Briscoe. Made by Alexandra Transport Company, thanks to Eric Flack for the info. Also refer to the entry for Hurll, Glasgow. Found on a Renfrewshire seashore by Ian Sinclair. Made at Inkerman Brickworks. Photo and info by Scottish Brickmarks. 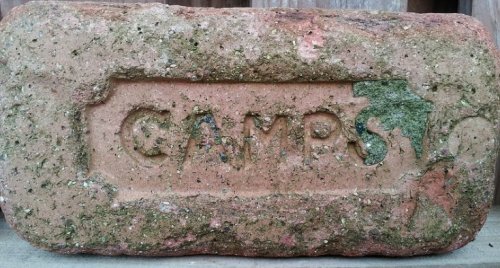 Found by Martin Briscoe near the shore at HMS Quebec / Kilbride Camp, Inveraray ' now a caravan park. Photo and research by Lairich Rig who thinks the full lettering is: Double Pressed Machine Bricks, Robert Adams, Paisley. "The estates of Robert Adams, Brick Manufacturer, Love-street, Paisley, were sequestrated on the 11th day of December, 1865, by the Sheriff of Renfrewshire ..." ["London Gazette", Friday, December 15th, 1865 - see second column. Part of the Summerlee collection, photo by Monkland Memories. Airdrie Brickworks, Petersburn, 1938 - 1978. 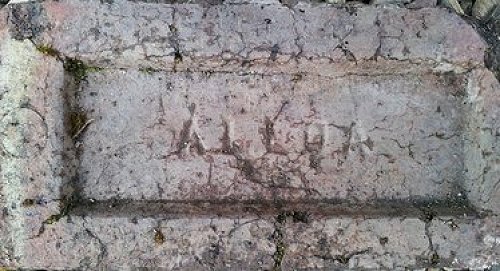 Found by Philip Dikland during restoration of the Alliance Plantation house in Surinam, South America. 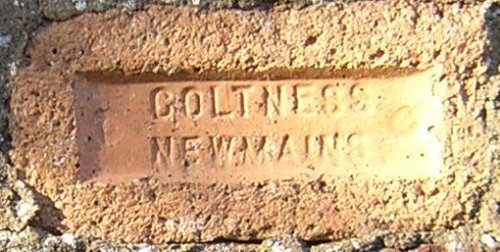 This firebrick was used in a late nineteenth century gasworks at Castleward, Co. Down (now a National Trust property). This example was glazed by a craft potter in the late twentieth century. Photo and info by George Rutherford. Found on the north shore of the Firth of Forth by Mark Cranston. Photographed in Edinburgh by Andrew Rush. Found on the seashore in Ballantrae, Ayrshire by Christine. Annandale Brickworks, Crosshouse. Found on the seashore near Stranraer by Jonathan Wilkins. 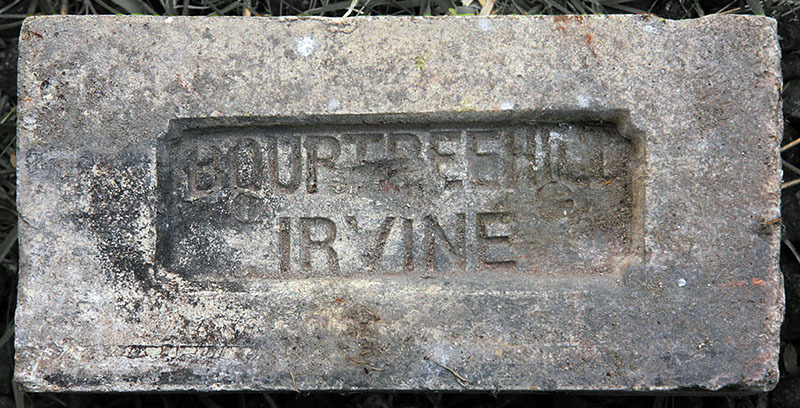 Made in Dunfermline and found in Guardbridge, Fife. 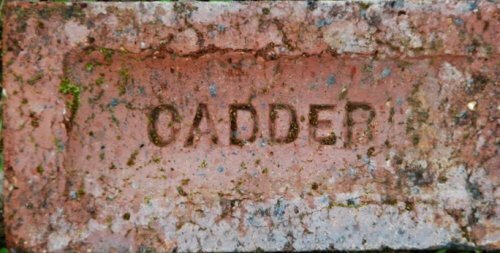 Photo courtesy of Scottish Brickmarks. 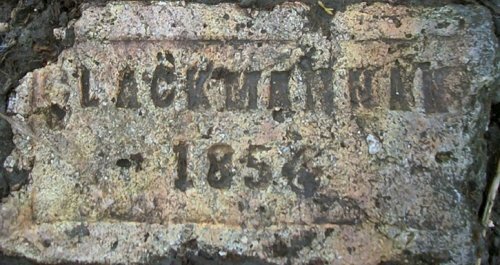 Two very old bricks, 1857 and 1866, made in Arniston near Edinburgh. Photos by Mark Cranston. 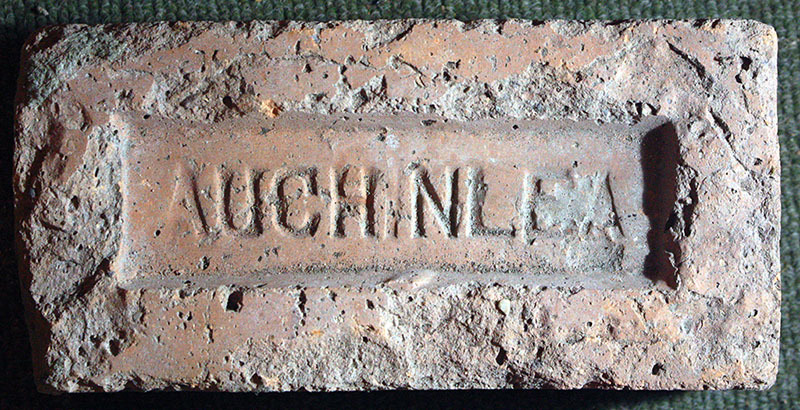 Brown Archibald, Auchenheath brick & tile works, Auchenheath, Lanarkshire. Photo and info by Mark Cranston. 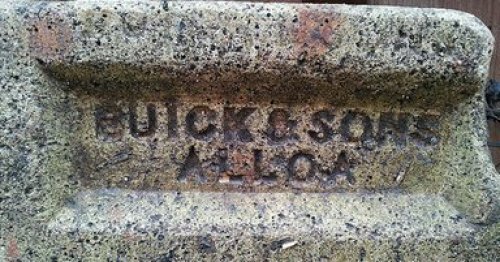 Made by Auchinlea Quarries and Brickworks, Cleland, North Lanarkshire, found by Martin Briscoe in Fort William. William Campbell writes: The company had two brickworks and a quarry in the village: (1) brickworks at the back of Cleland railway station (Windyedge) and (2) a quarry and brickworks on the A73 Carlisle Road, between Bellside in Cleland and Hareshaw village adjacent to the Old Winery buildings on the north east side. 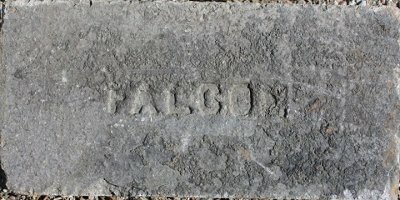 For a time during the 1950's the company had the contract for supplying brick for the construction of all new F.W. Woolworth stores in Scotland. Site (1) is now a transport depot and storage yard. Site (2) is currently being redeveloped by landfill and reclamation . Found at the back of the Glenbarr War Memorial by Martin. Auchlochan collieries at Coalburn were part of the Wm Dixon Ltd empire. It appears that the brickworks had either closed or been sold by 1947 as it was not passed to the NCB. Photo and information by David Kitching. The Balgonie Colliery Company operated the brickworks alongside the colliery in Thornton, Fife. It appears that the brickworks had either closed or been sold by 1947 as it was not passed to the NCB. Photo and information by David Kitching. Found on the seashore in Ballantrae, Ayrshire by Christine. 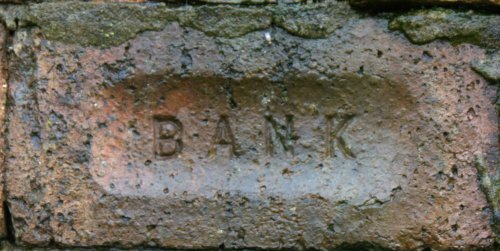 Bank brickworks, New Cumnock, 1938 - 1960. Taken at a WWII radar station, called Hush-Hush in the area. It is near Portpatrick, South of Stranraer. Photo and info by Martin Briscoe. Barbauchlaw Brickworks, Armadale, West Lothian, operated from c1893 to 1971. Robert Muir and Company originally owned the Barbauchlaw fireclay works as part of their Barbauchlaw Colliery. It passed to the National Coal Board in 1947 but the colliery closed in 1952. 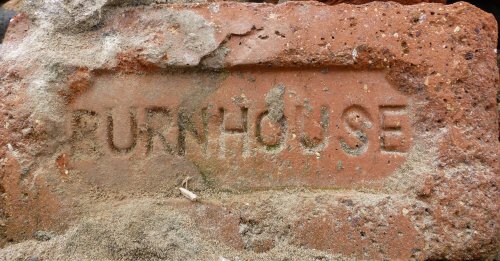 In its last two years the works was owned by the Scottish Brick Corporation. Photo by Alan Fleming and info by David Kitching. Made at Barony Colliery, South Ayrshire, photo by Mark Cranston. This one was found in a skip outside a house in the Grange district of Edinburgh. Thanks to Joseph Hodgkiss for the contribution. Made at Armadale, West Lothian and found at Haymarket, Edinburgh. Photo and info by Scottish Brickmarks. 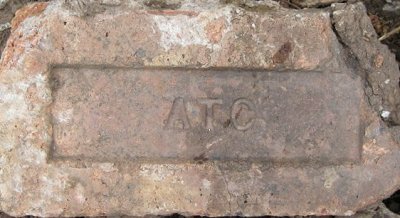 Probably an abbreviation of Bellfield & Co., Castlecary Fireclay and Lime Works, Stirlingshire. Found on the foreshore at Boness, West Lothian by Paul Shave. The works operated from 1866 - 1911, Andrew Greg discovered it in an 1860's house in Strathbungo, Glasgow. 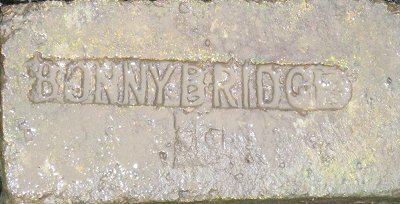 Thought to be a product of Millstone Grit And Fireclay Ltd, Herbertshire Works, Denny. Photo by Martyn Fretwell. Found by Martin Briscoe by an old concrete slipway and perhaps pier at the bottom of Loch Arkaig, probably left over from the Commando Training Centre in WWII. 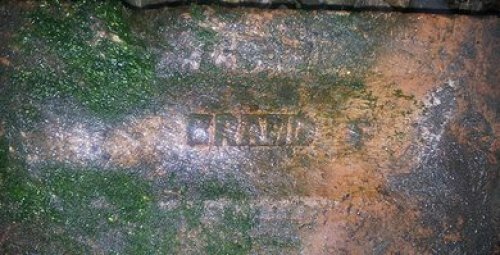 Found by Frank Lawson at one of the WW2 sites on Loch Ewe (It was a collection point for Russian convoys in WW2) - made at Blairadam Brickworks, Kelty, Fife. 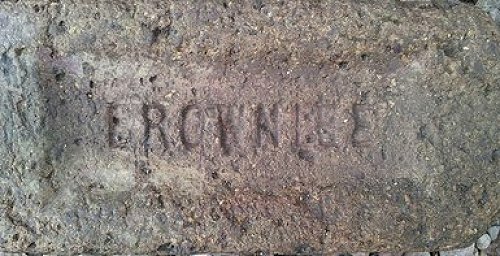 The brick was made at Blantyreferme Brick Works, near Uddingston, open 1924 - 1947. Thanks to Lairich Rig for the photo. The works was somewhere near the Monkland Canal in Springburn, Glasgow. Photo and information by David Kitching. Photo by Mark Cranston. 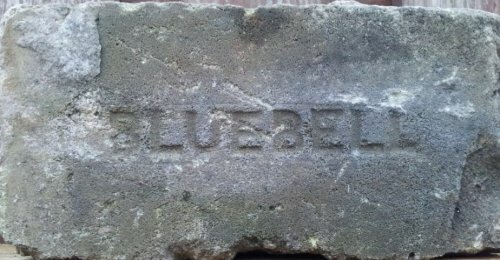 A product of the Stein brickworks, made between 1890 - 1900. Photo by William McKelvie. Boghead Fireclay Works, Bathgate, 1889 - 1930. 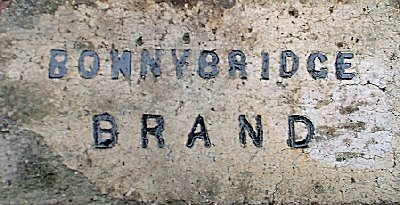 Bonnybridge Silica & Fireclay Works, 1874 - 1971. 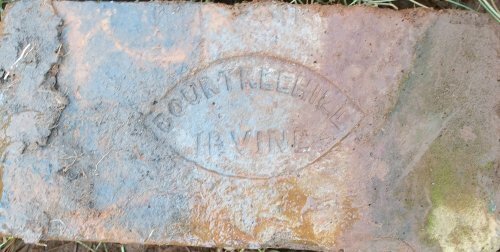 This firebrick was found near Brymbo in North Wales. It was presumably used in the nearby steelworks. 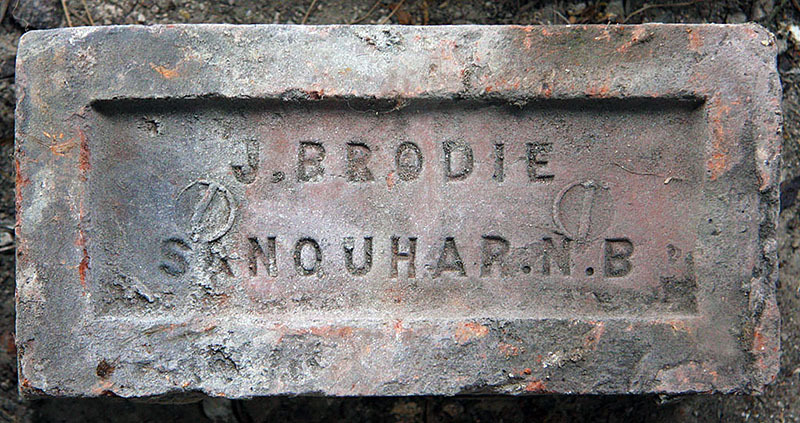 The first of three Scottish brick photos sent by Robert Runyard from CHILE. 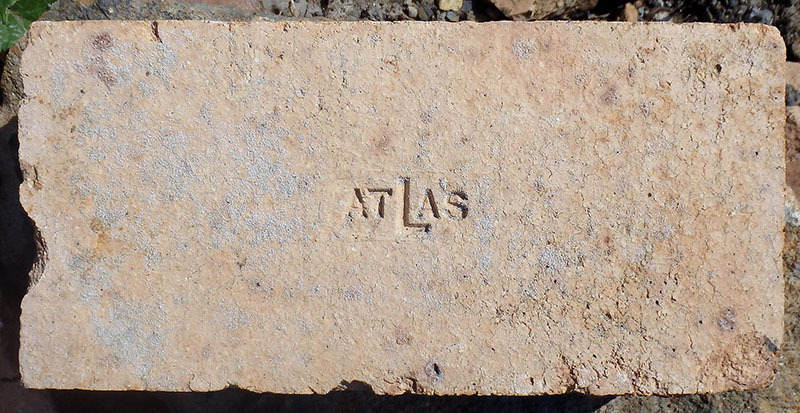 The bricks were found in a now closed animal processing and freezer complex in Puerto Bories in Chilean Patagonia. This brick is a high density (H.D.) good strength, good load bearing fire brick which is used in high temperature applications. It was found in an allotment garden near to the Steelite International pottery works in Middleport Stoke- on- Trent by Ken Perkins. This factory was previously Dunn and Bennett & Co (1875-1980S). 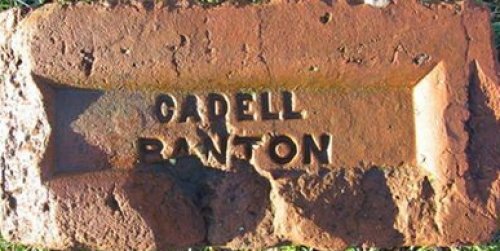 Ken thinks this brick came from one of the kilns that were either repaired or demolished when Steelite took over. 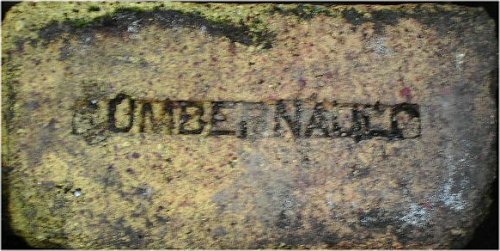 Found at the site of Niddrie Brickworks, Edinburgh by Ian Suddaby. Made by Southhook Potteries at the Bonnyton Fireclay Works, Kilmarnock between the 1880s and 1963. Found in Galston. Photo and info by Scottish Brickmarks. Found on the seashore in Ballantrae, Ayrshire by Christine. 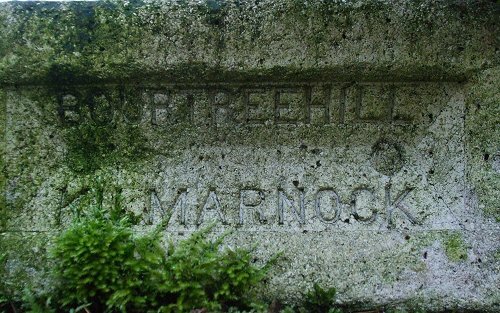 David Kitching adds: The Bourtreehill Coal Co. Ltd, Dreghorn once operated a mine and brickworks just to the north of Dreghorn village. The brickworks appears to have started c1875 and ran until 1969. Donna found this one near Irvine, Ayrshire. It is a very heavy one. Made in East Wemyss, Fife. 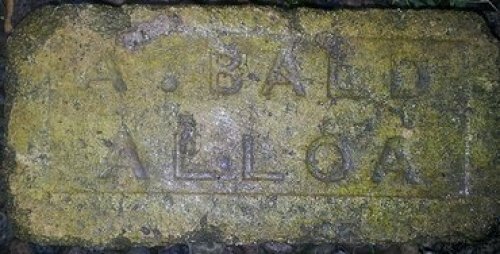 found by Paul Shave in Toryburn, Fife. Sanquhar is 26 miles north west of Dumfries in southern Scotland and was once an important coal mining town. In 1852 by Mr Geo. 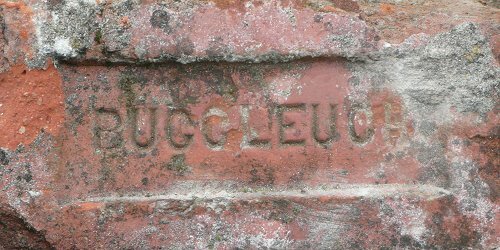 Cleunel opened a brick and tile work in Sanquhar, soon building a large and prosperous trade in drainage tiles but by the 1880s was suffering from a lack of capital and modernisation. In 1889 by another tenant, Mr James Brodie, took over and soon improved and extended the works, which by 1891 comprised five Newcastle Kilns and a Staffordshire Oven. The improved plant included a machine for the production of pressed bricks for outside building. Messrs Isherwood Brothers ran the works at a later stage, and then a Mr Scott. Eventually they were taken over by the Sanquhar and Kirkconnel Collieries Company. Photo and info by David Kitching. Thanks to Andrew Gardner for the photo. 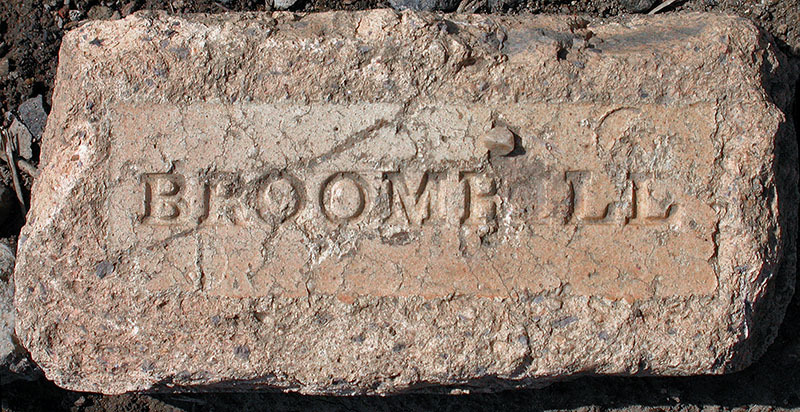 The Broomhill Firebrick Co was located at High Bonnybridge, Stirlingshire and operated from 1915 - 1980. Photo and information by David Kitching. 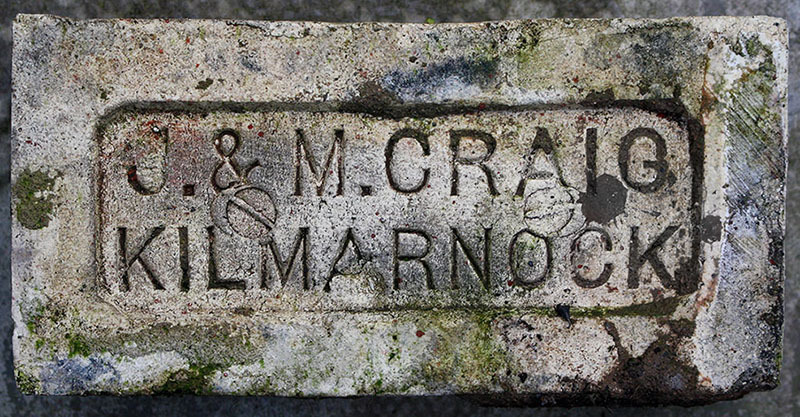 Martin Briscoe found this one in Inverlochy, a "village" of Fort William built for workers at the aluminium smelter. 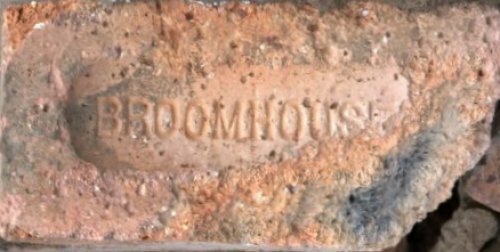 Broomhouse Brickworks, 1921 - 1940. Spotted on a demolition site in Fort William by Martin Briscoe. Brora in Sutherland was quite a busy industrial area years ago. Apart from the brickworks there was also a colliery, the furthest north in Britain. The brickworks closed in the 1970's, further details here. Photo by Derek Gill. Pete Higgins adds: The brickyard at Brora started in 1814, closed in 1826, re-opened in 1873, and was taken over by the tweed firm, Hunters, in 1914. They ceased operations in 1949, but the brickyard did not close until the 1970s. I think the example on your website is from 1949 to the 1970s. 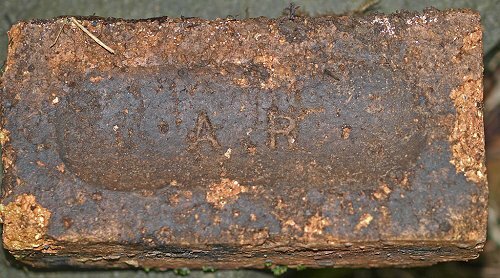 Made in Wishaw, Lanarkshire and found in a probable WWII gun position in Fort William, photo by Martin Briscoe. 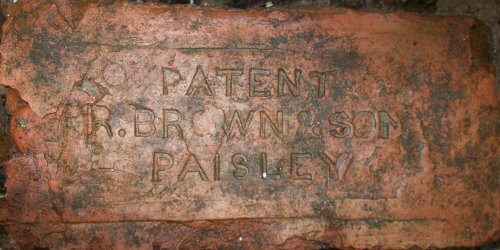 The full lettering is: Patent, R. Brown & Son Ltd, Paisley and it was found on a Renfrewshire seashore by Ian Sinclair. 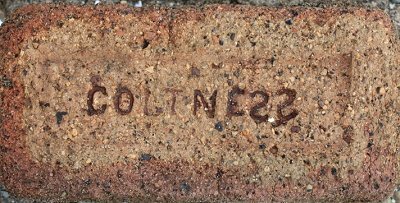 Pete Higgins writes: some of these bricks have turned up on the Chilcoot trail in the Yukon and in California. Found by Lairich Rig just north of Dumbarton Golf Course. Found in Moffat, Dumfrieshire by Peter Robinson. Brucefield Brickworks, Kennet,Clackmannanshire. Associated with Brucefield Colliery. Photo by courtesy of the Frank Lawson collection. Spotted by Dave Orr in Glamis. 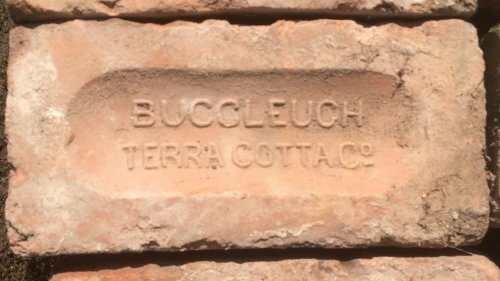 Buccleuch Terra Cotta works, Sanquhar, 1889 - 1950s. Spotted in Dumfries by Edward Adams. Photo by Gary Buckham, works info not known. Thanks to Lairich Rig for the contribution. Eric Flack writes: The CADDER works was at the Balmuilday Road near Bishopbriggs, 1938 - 1969. Found at a torpedo testing site in Arrochar at Loch Long by Ian Sinclair. The brickworks on Balmuildy road was reputed to be on the site of the former Cadder No.15 PIT (where 22 men died in a fire in 1913) Initially with 3 Dutch design 'Vlammoven' chamber kilns, each with 28 chambers the central kiln quickly being demolished in the late 1970's and replaced by a dryer as the in-kiln drying (Watersmoking) being unsuccessful. It was purchased from LAW Mining as a 'mothballed' site in around 1996, [along with the operating Tannochside and West Lothian sites], recommissioned as Ibstock Scottish Brick Bishopbriggs, and finally closed in late 1999 with the equipment being removed. The making equipment was by Craven Fawcett from Wakefield, being Incla Mk.3 dry pans and two Centex 430 extruders, installed in 1974/5 by the SBC [Scottish Brick Co Ltd] former NCB works. Info and photo by Chris Deacon. 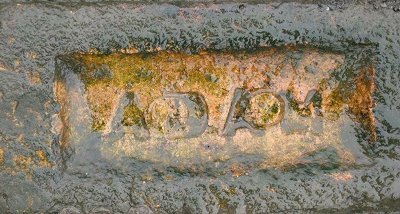 Found on the foreshore at Bo'ness, West Lothian by Paul Shave. 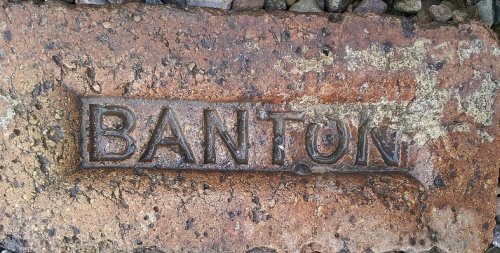 Made at Banton Brickworks, Kilsyth. Photo and info by Scottish Brickmarks. Calder Brickworks, Airdrie. c1893 to 1971. Photo and information by David Kitching. Photo by Ian Suddaby. 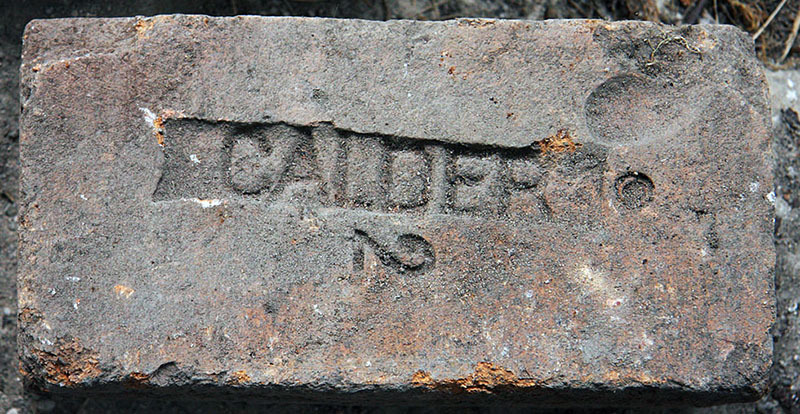 Found on the site of Niddrie brickworks near Edinburgh. Found by John Sutherland on a beach near Edinburgh. This one is only about a third of the size of a normal brick and is probably a salesman's sample. The full lettering reads: Patent, Wm. Wilson, Campbellfield, Glasgow. The history of the Campbellfield pottery works can be read here. The original address of the Campbellfield Pottery was 706 Gallowgate. About 1889, it moved to Flemington Street in Springburn. Thanks to Lairich Rig for the photo and info. Martin Briscoe photographed this one in Corpach. Made in Denny near Falkirk. Found in Torwood near Falkirk by Peggy Edwards. 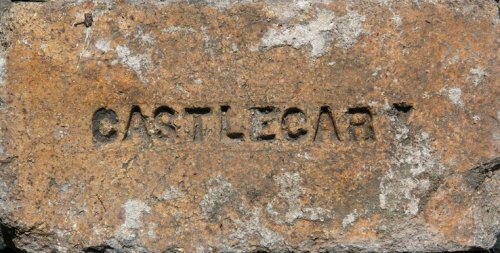 Made in Carluke, Lanarkshire by Caradale Brick Ltd.
Cardowan Works, Garnkirk, 1861 - 1911. This is a product of the one operated by Andrew Jeffrey's Carfin Coal Co, Carfin, Motherwell, Lanarkshire, between c1859 and c1939. Photo and information by David Kitching. Part of the Summerlee collection, photos by Monkland Memories. Johanna Maria Lind (October 6, 1820 ' November 2, 1887), better known as Jenny Lind, was a Swedish opera singer, often known as the "Swedish Nightingale". Photo and info by Alan Davies. 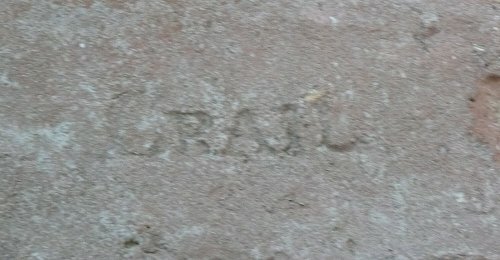 This brick was produced by W. R. & J Carmichael. 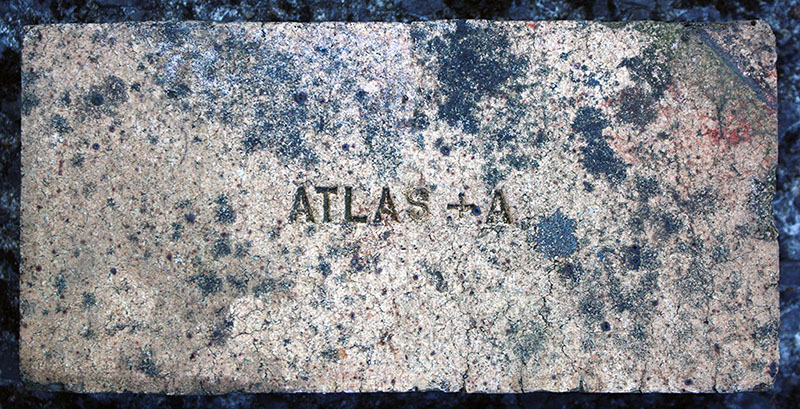 Brick & Tile works of Alloa. 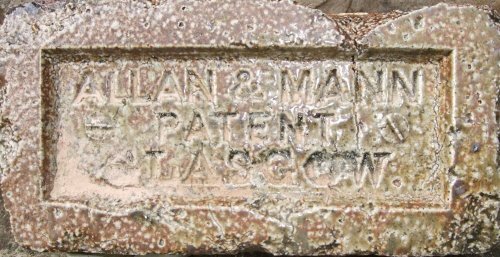 The brick is also stamped on the other side, the word 'PATENT' appearing twice. The Company supplied some of the elaborate polychrome brickwork for Templeton's Carpet Factory in Glasgow built in 1889; and modelled on the Doge's Palace, Venice - now the Templeton Business Centre . The brickworks operated from 1867 to 1915. Photo and information by Fiona Munro. Cumbernauld, Dunbartonshire. Photo and information by David Kitching. From Gillies Hill, Cambusbarron, Scotland from a structure in the Murrayshall Quarry, thanks to Peggy Edwards for the photo. Cherriton Brickworks, Tullygarth, 1935 - 1950's. Found by Roddy Binnie in Burrelton, Perthshire. established by 1865 it had closed before 1900. - Image courtesy of Alan Fleming, information by David Kitching. Found by Fiona Munro in Galashiels. Clyde Ironworks and Fire Brick Works, Tollcross, Glasgow. 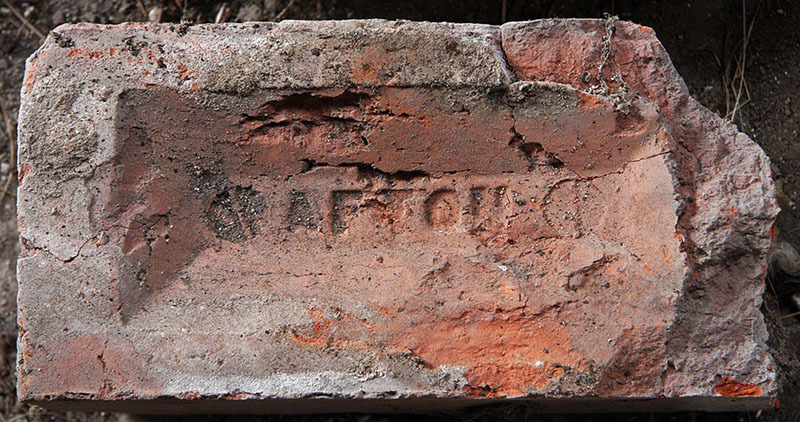 1890 - 1891 James Dunlop & Co, Fire brick manufacturers, fire bricks, facing bricks, covers, ground fire clay. Works - Clyde Ironworks by Tollcross. Office - 175 West George Street. 1912 - 1913 - James Dunlop & Co Ltd.
Info by Mark Cranston and photo by Guy Morgan. Found by William McKelvie in Cobbinshaw, West Lothian. 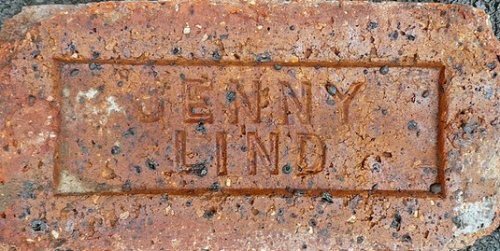 The brick could have been made here. 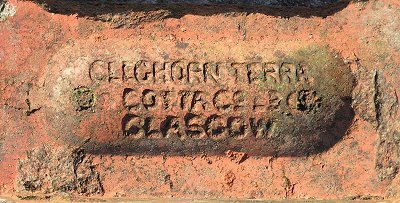 Martin Briscoe found this one on the foreshore at Fort William, the spelling leaves something to be desired! 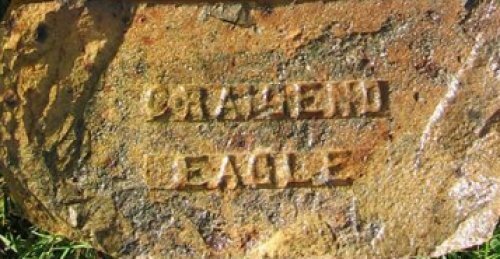 Found by Bill McKelvie in an old lead mining and smelting works in Wanlockhead, Dumfriesshire. Coltness Stepends, photographed at Summerlee Museum. Found at Hartwood Hospital by Lee Robinson. Photo by Molly Buckley who found it in a dump in Broxburn, West Lothian. Patent, Robert Corbet, Newlands, Glasgow. Photo by Mark Cranston. 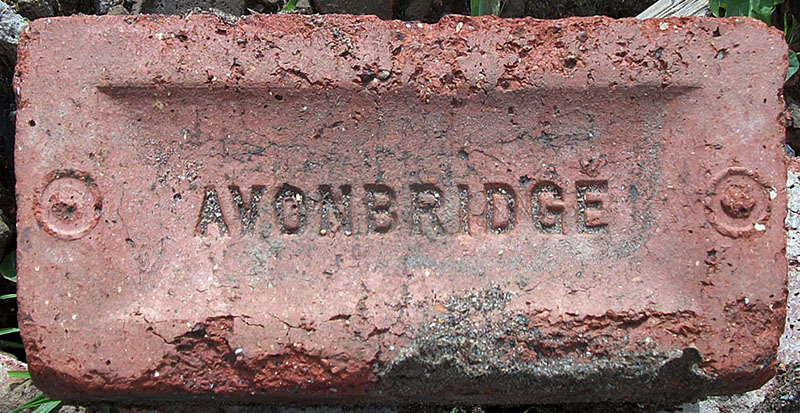 NB - thumbmark in brick.Photo by courtesy of the Frank Lawson collection. was incorporated as J.& M. Craig Ltd in 1896 but went into liquidation in 1923. At both sites the company worked coal and fireclay mines. Photo and information by David Kitching. 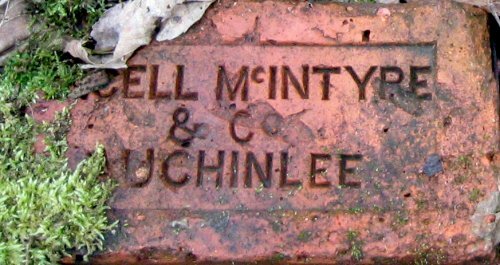 Two products from Craigend Brickworks at Muiravonside near Falkirk. Made between 1938 and 1983. Photo and info by Scottish Brickmarks. Photo by Martyn Fretwell courtesy of the Bill Richardson Collection at Southwick Hall. 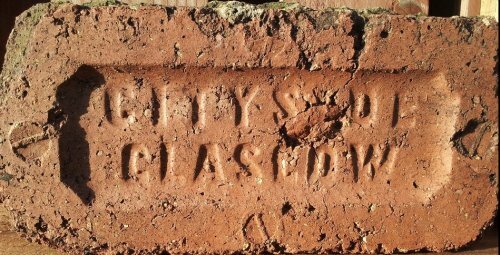 Craigrigg brickworks was located in Westfield, Armadale, West Lothian and was in production from the late 1930's to the 1950's. 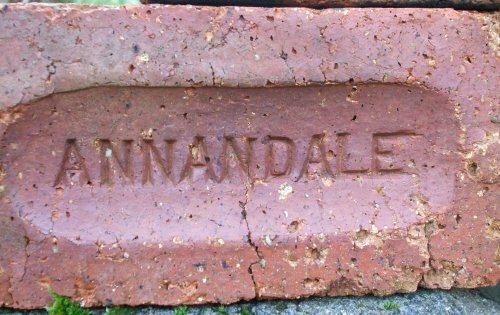 The West Lothian Archaeology Group have a very interesting illustrated feature on brickmaking in Armadale. Thanks to Joseph Hodgkiss for the photo and information. Photographed in Crail, Fife museum by Dave Orr. The brickworks were by the harbour at Crail. This works near Aberdeen operated from 1902 to 1990. Photo and info by Scottish Brickmarks.